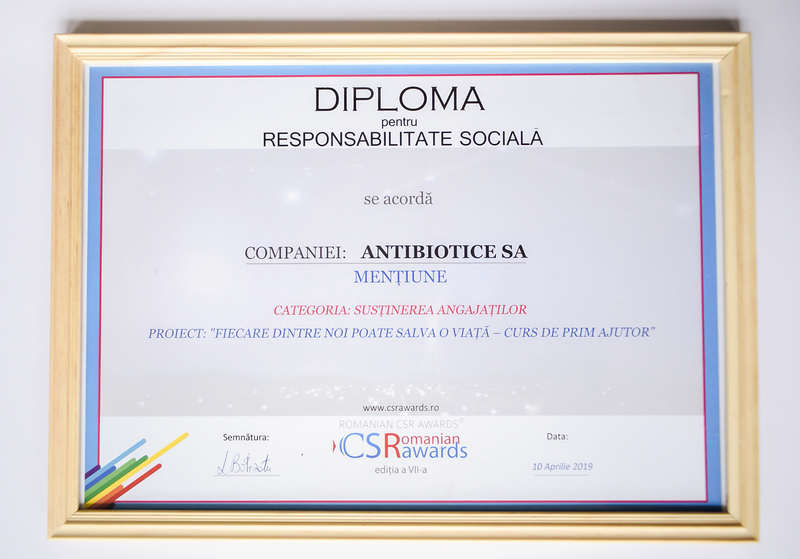 Antibiotice Company has won two awards at the Romanian CSR Awards 2019: the first place and the trophy in the category “Internal CSR Campaigns” for the project “Donate Blood! Put a Soul for Life! “And a Mention for” Employee Support “for the” Everyone Can Save a Lifetime – First Aid Course “for Antibiotic employees. 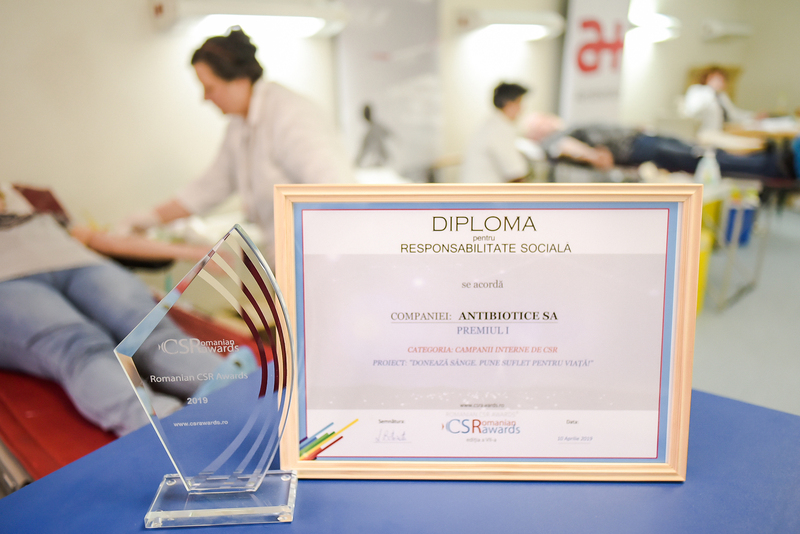 The event organized by CSR Media took place on Wednesday, April 10, 2019 in Bucharest and offers recognition of the best Corporate Social Responsibility (CSR) projects run by Romanian companies in 2018. In this competition were registered 176 projects from of 100 companies that carry out social responsibility campaigns. The Donate Blood Program! Puts the soul to life! “Awarded with the 1st place became a tradition in the company Antibiotice, constantly unfolding since 2010, its last edition, the 16th, running one day away from granting the prize, on April 11th. The project, which enjoys the active and voluntary involvement of the employees, was initiated in order to fill in the blood deficit that is constantly registered by the hospitals in the area of ​​Moldova. With the power of the example offered by the company’s employees, the civic spirit is promoted in the community about the need for voluntary blood donation. Over 8 years of campaign, 800 blood donations and over 2400 saved lives have been recorded. The second award winning project, “Everyone Can Save a Life!” Was launched in 2018, being held in the context of the World Cardiomyopathy Prevention Day. 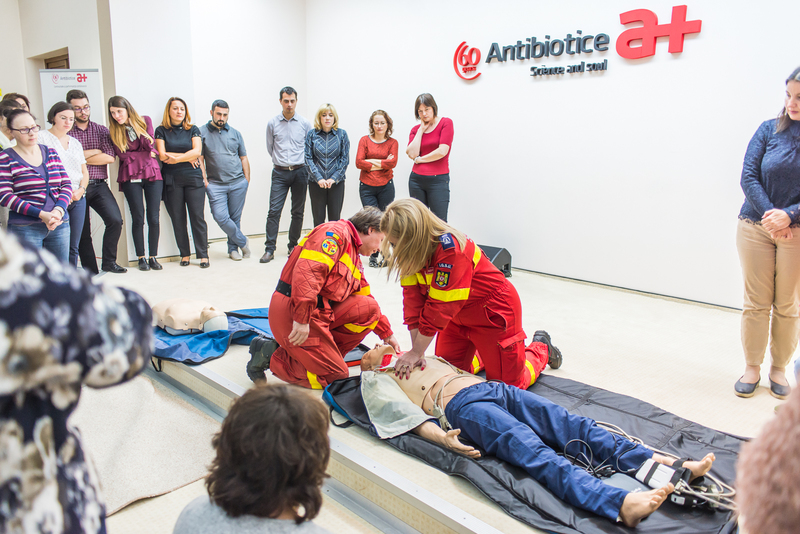 The project aimed at promoting first aid measures among 100 Antibiotice employees, but also making them responsible in emergencies to support their peers. The course was supported in partnership with the SMURD Iasi service and will continue in 2019 so that the number of employees having first-aid benefits useful both in the professional environment and outside it will increase. “The awarding of the two prizes honors, mobilizes us and makes us responsible. The social responsibility projects we carry out in the four major areas – health, education, social and environmental protection – aim to bring added value and constantly contribute to community development. Being responsible and friendly in our communities, we make sure that together we build a better future for us and others around us, helping to improve health and protect the environment, “said Ioana Tode, president of the Antibiotice Foundation Science and Soul “. The two awards join the one received in 2018 by CSR Media, respectively – the third prize for the Science and Soul Scholarships. The CSR projects and CSR campaigns of the awarded Romanian companies in Romania are the ones that lead to the improvement and change in the long term, the quality of life of the Romanian employees, customers and communities.